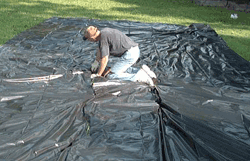 Moisture barriers are basically thick sheets of plastic that are laid down directly on the ground of a crawl space to prevent ground moisture affecting wood members of the structure. They are usually recommended when moisture conditions do exist in crawl spaces due to drainage, pipe leaks, air conditioning condensation, poor ventilation, or just damp climates. When we evaluate your structure for a moisture barrier we will inspect the wood for mildew, fungus, rots, and moisture damage. DellPest may take a reading with it's specialized meter to determine whether its needed. 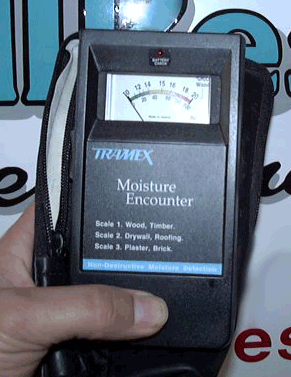 Moisutre meter determines the percentage of moisture on wood members. Customizing the cut of the barrier. Carefully putting the barrier in place. Barriers are placed under pipes to get as close to the soil as possible. If you do need a moisture barrier, DellPest will customize the cut to control the moisture properly. this is usually an average of 80% of the crawl space. Sometimes putting down a moisture barrier covering too much of the surface area could dry the wood out causing problems with dry rot or lessening the life of the wood. Barriers do have to breathe. Other disadvantages of barriers would be a cleaner crawl space in case anyone needs to do plumbing, furnace, wiring or any other task that may have to be done. Also some people have reported less allergy problems due to dust and other harmful things associated with crawl spaces. So it is important that you have a professional opinion on the need of your moisture barrier.